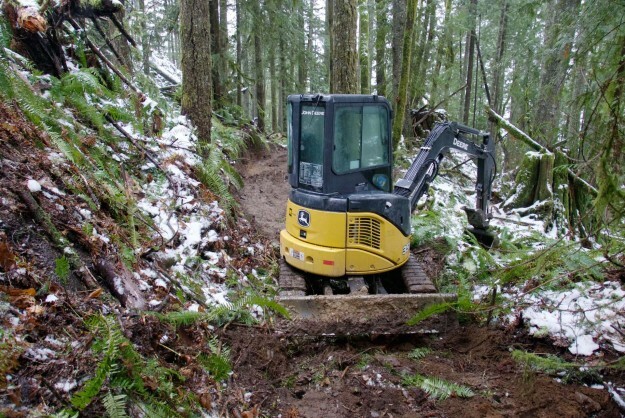 Work has begun on the new Granite Creek shortcut trail. 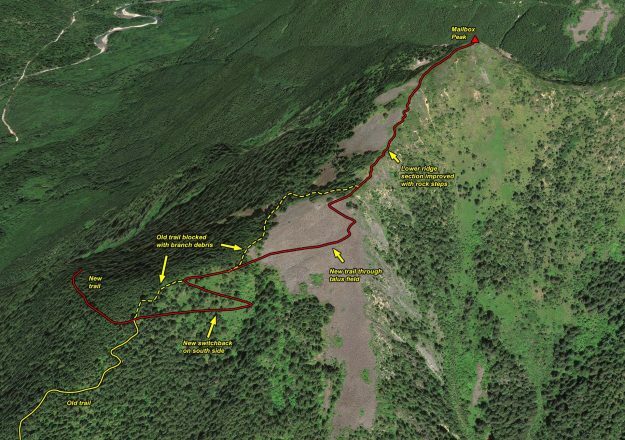 This trail will start at a new parking lot the DNR plans to build near the concrete bridge and will wind up the ridge west of Granite Creek to join the old road, recently converted to a trail. 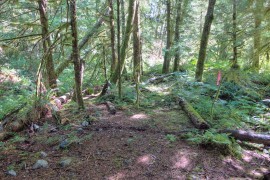 The new trail starts out on an old logging road but leaves about 1/3 miles in on a new track that stays along the ridge line. 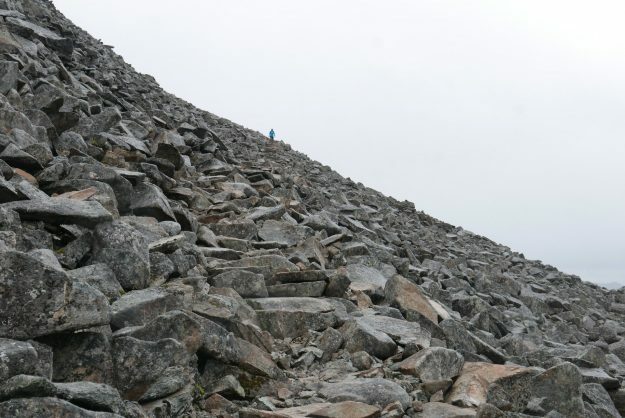 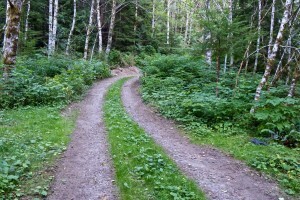 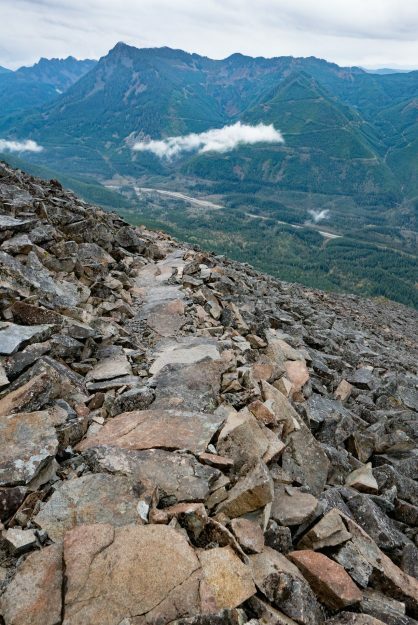 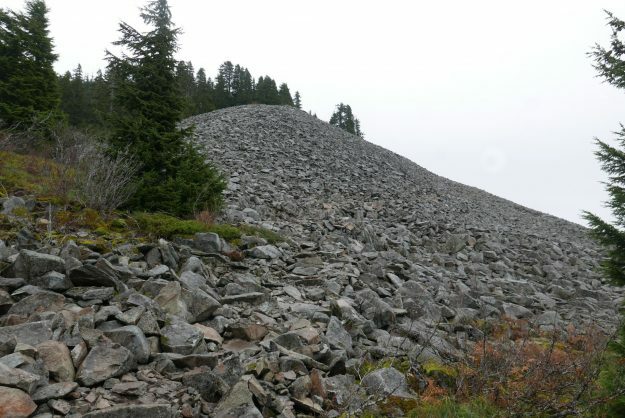 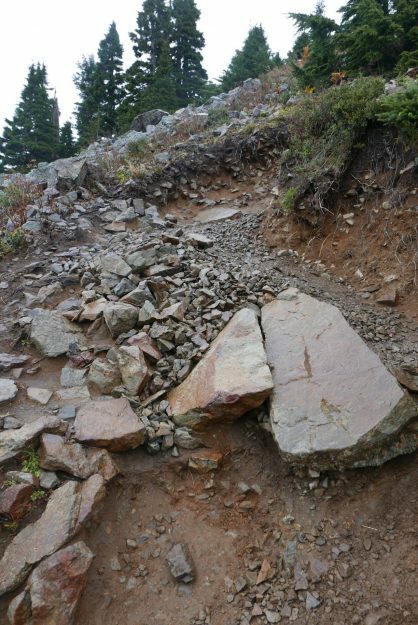 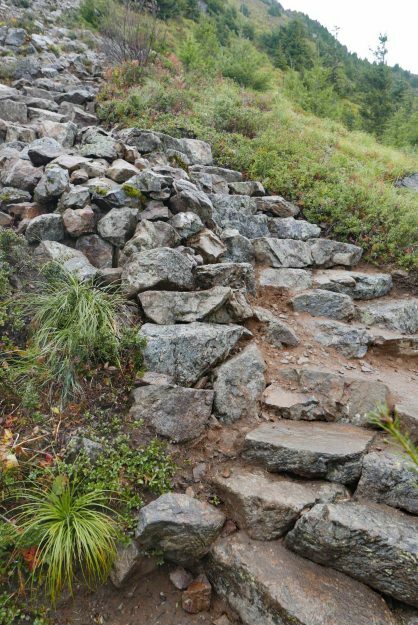 For a number of years there has been a little know user-built trail that some hikers have used to shorten the distance to Granite Lakes by about 1 1/2 miles each way. 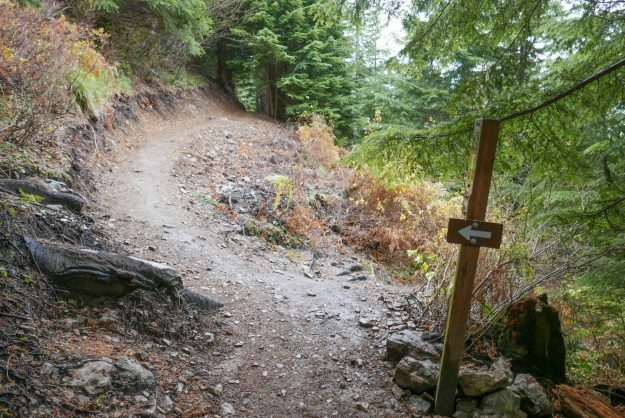 Sections of that trail have always been steep and muddy and the new trail looks like it will be a big improvement when completed. 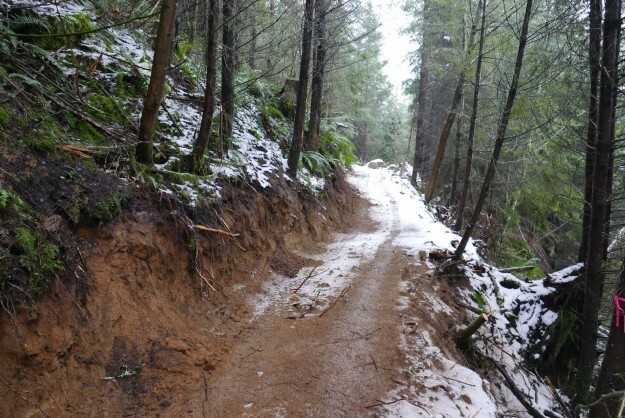 But as of December 26 with recent rains and snow, the new trail is also very muddy and slippery and does not yet connect with the main trail above. 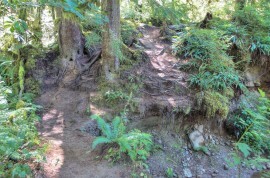 New Granite Creek shortcut trail route. 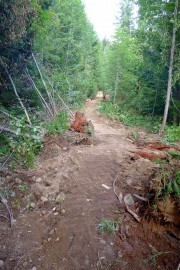 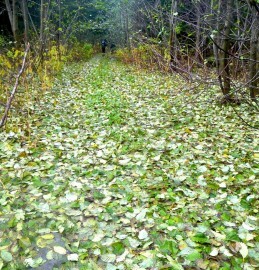 The trail is still being roughed in. 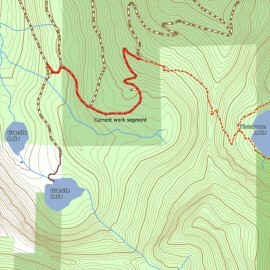 The dotted line is based on pink flagging indicating where the rest of the trail will probably be located. 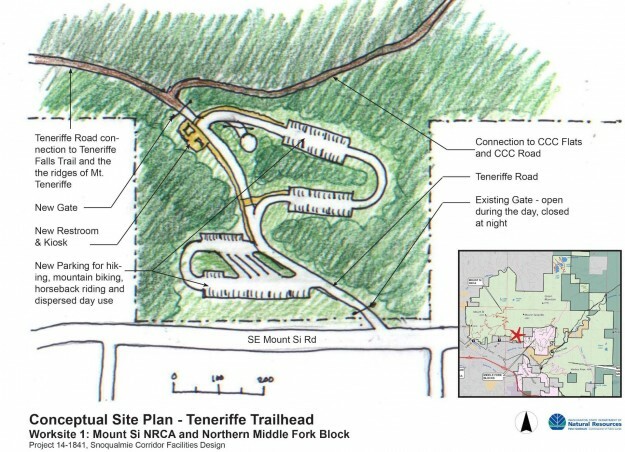 2009 trail route concept. 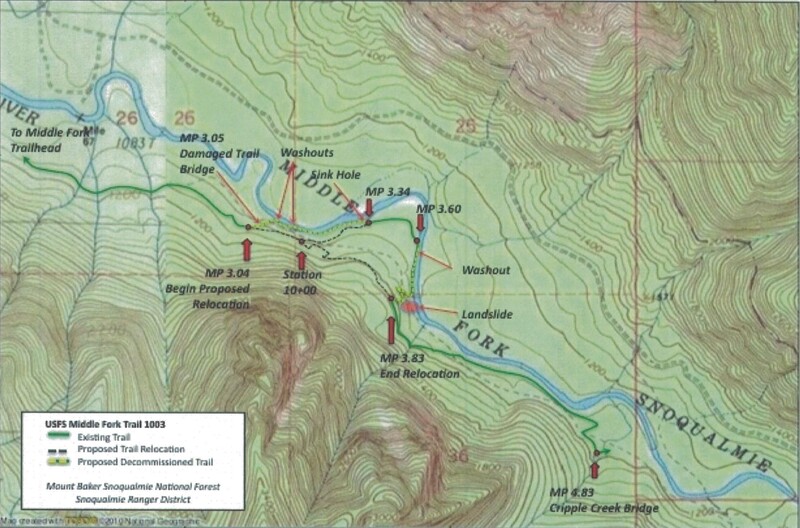 Planning has been going on for a long time. 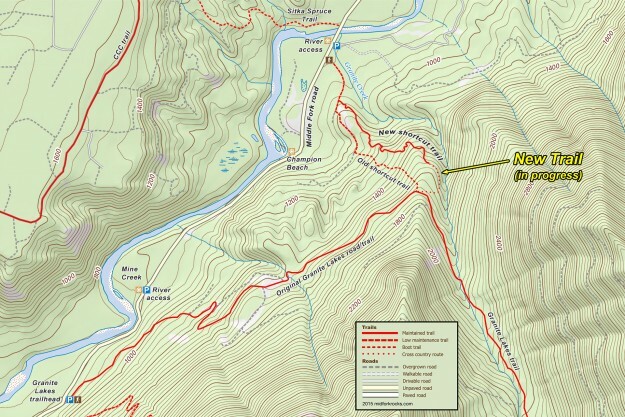 The route as constructed deviates quite a bit from this early version. 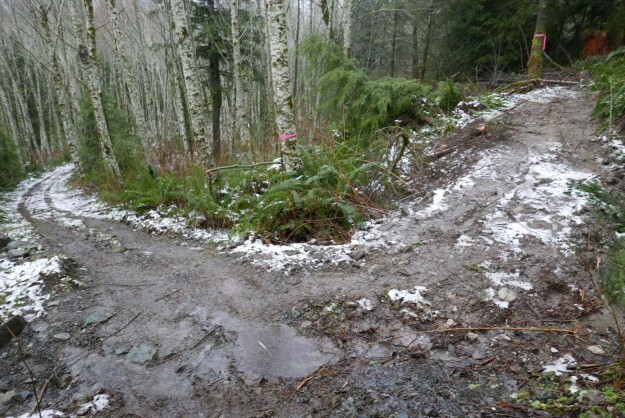 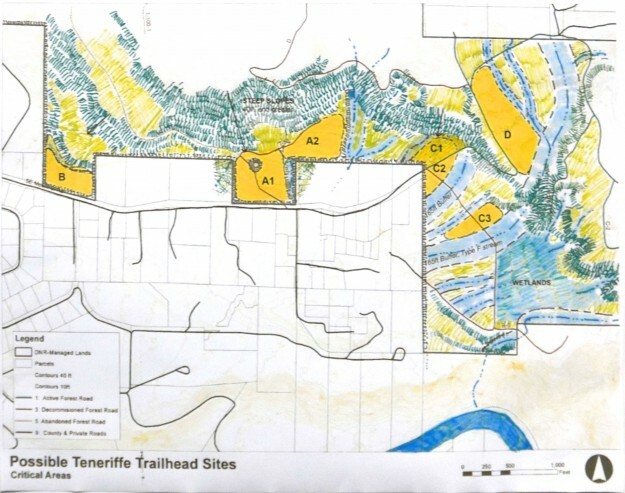 This entry was posted in Granite Creek and tagged DNR, new trail on 2015/12/18 by mvanderbilt. 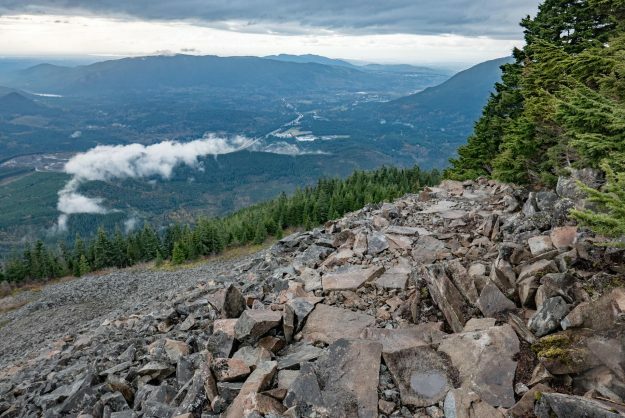 As part of it’s “Every Trail Connects” campaign, REI invited its members and the outdoor community across the country to have a direct effect on the trails they love. 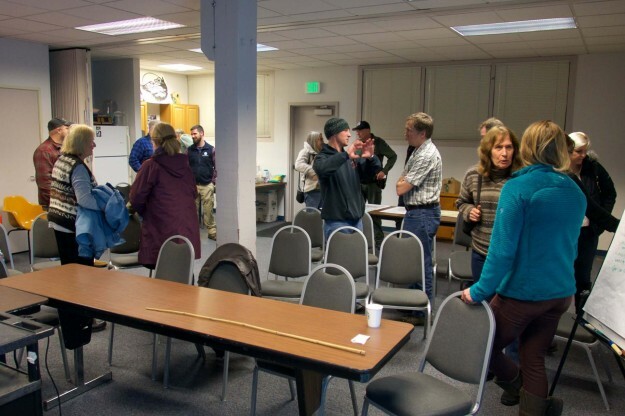 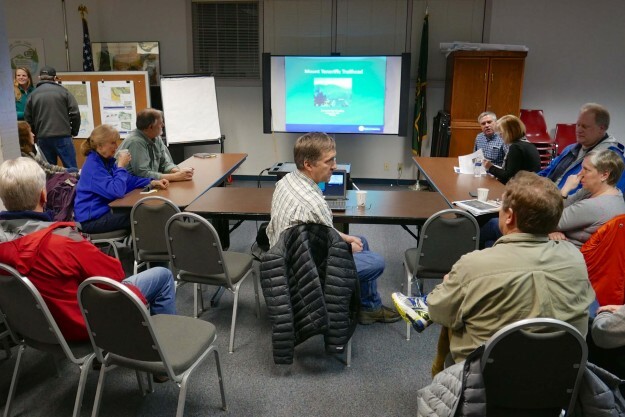 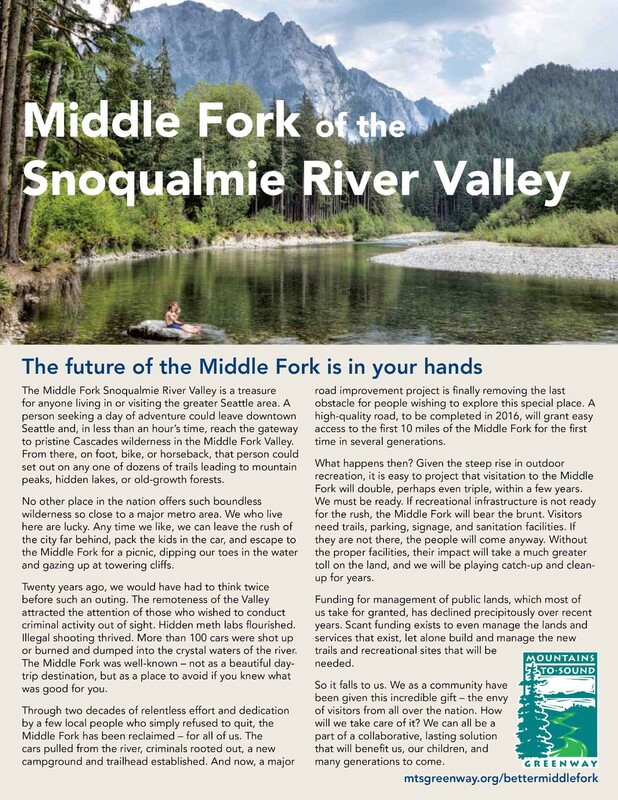 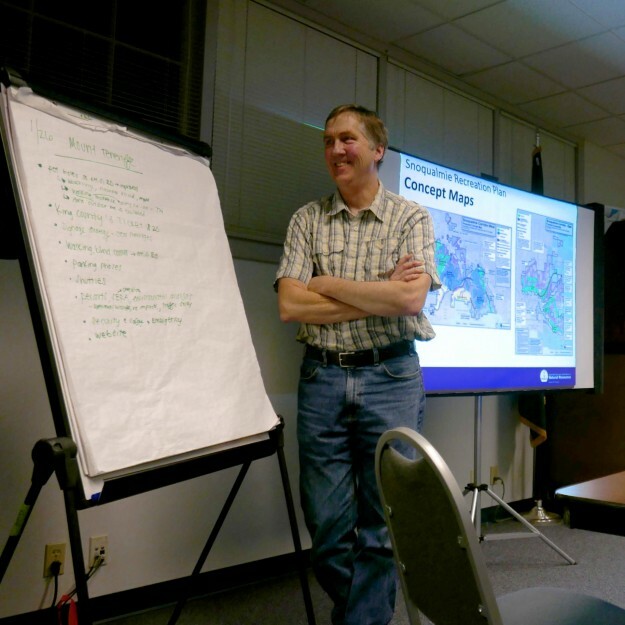 Community votes determined how to invest $500,000 with 10 nonprofit partners to support 10 selected trails including the Middle Fork Trail on the Snoqualmie River. 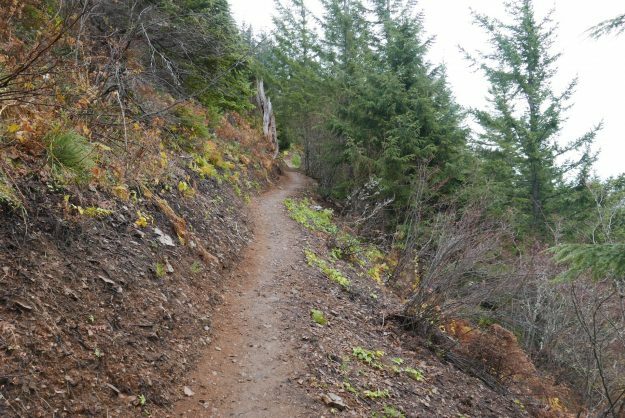 Each vote (one per day, per person) meant a $5 investment in the selected trail. 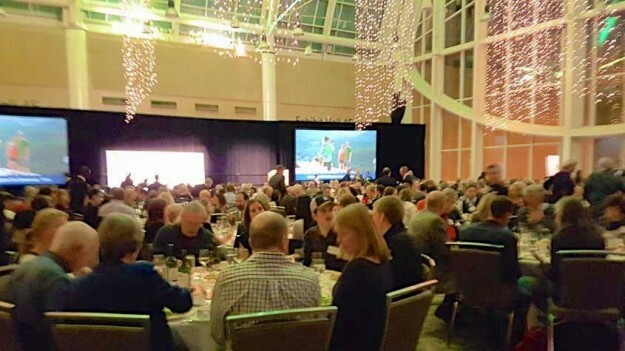 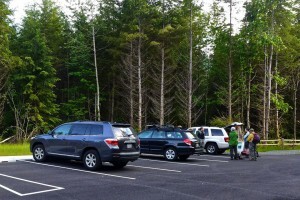 The investment is part of $5.9 million that REI is granting in 2015 to more than 300 nonprofits working to create access to more than 1,000 outdoor places throughout the United States. 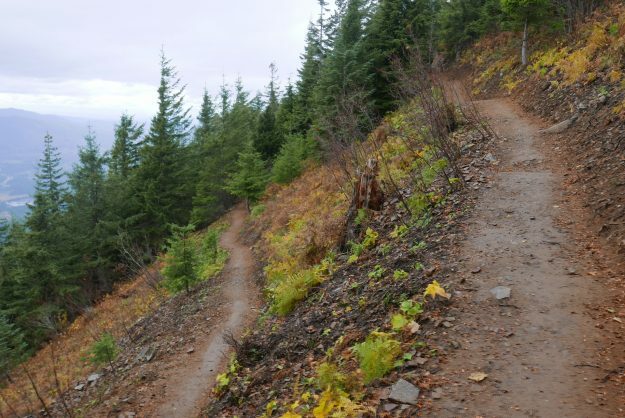 Because of the 3 hour time zone difference with the east coast, the Middle Fork Trail got off to a slow start, but as word spread on local hiking sites and social media the votes started coming in at a brisk pace. Ultimately, the Middle Fork trail got the 5th highest vote total, just 3,242 votes shy of the maximum 15,000. 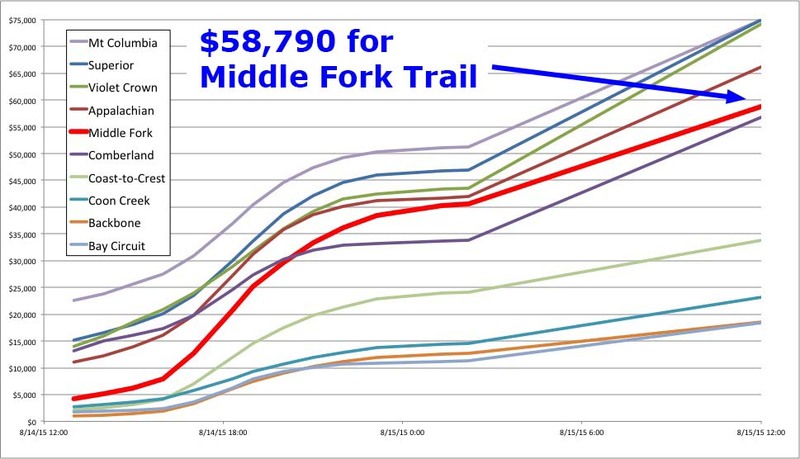 After the voting was done REI added a $10,000 bonus to each of the 10 trails, raising the total to $68,790. 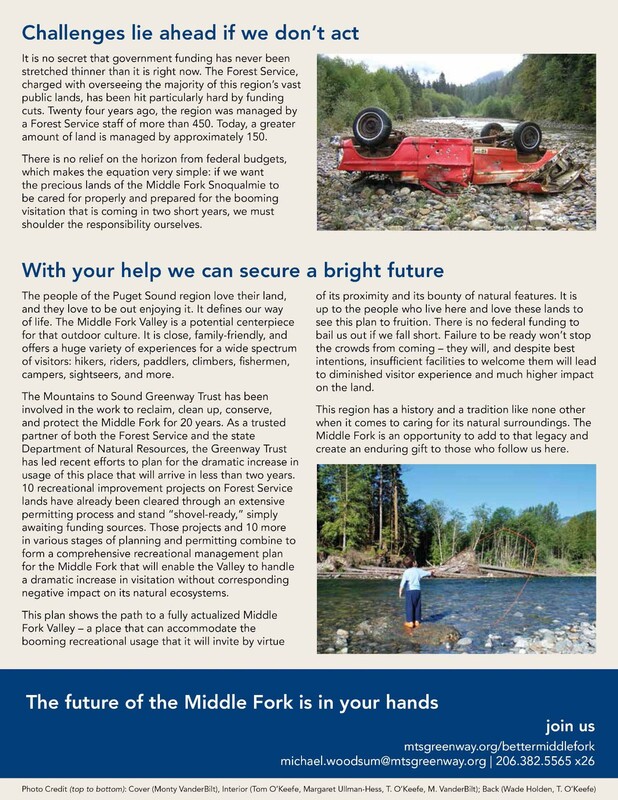 The funds will help repair multiple washouts on the Middle Fork Trail from the severe November 2006 and January 2009 floods and reroute a section located on a rapidly migrating river bend to higher ground. 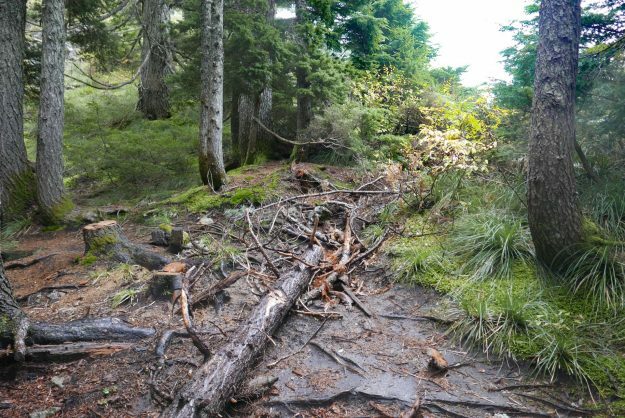 The project also includes removing approximately 0.5 miles of washed-out trail segments to promote natural re-vegetation and repairing portions of the damaged wood boardwalks. 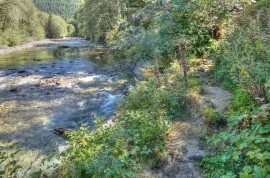 Unfortunately, it’s not enough money to add a badly needed bridge at the Thunder Creek crossing. 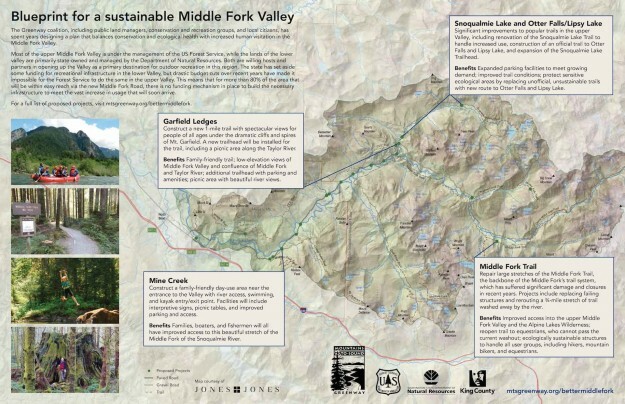 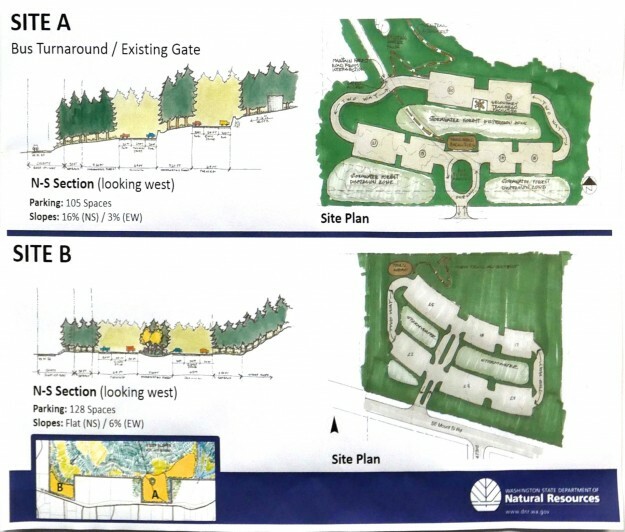 The work will be done through a partnership with the Mountains to Sound Greenway Trust and Washington Trails Association. 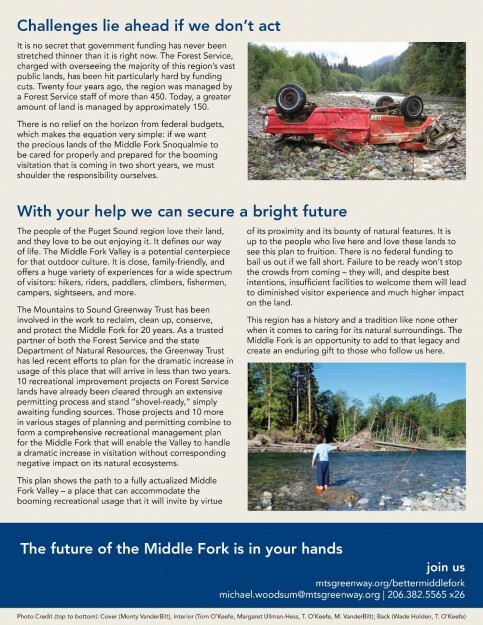 The unfunded 2012 PRISM Project #12-1743 details much of the work that has been deferred due to lack of funds. 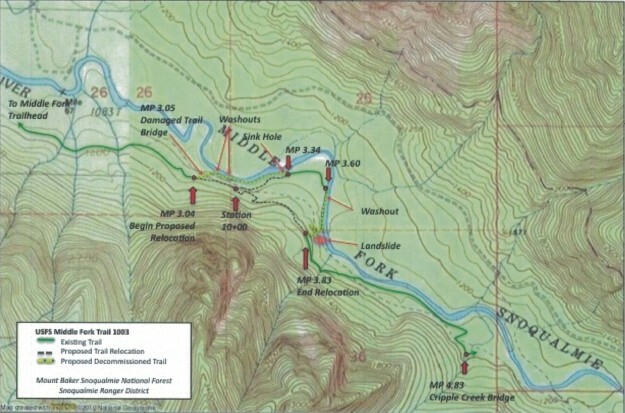 The plans for the reroute were published by the USFS as SOPA Project 94062 in July, 2013. 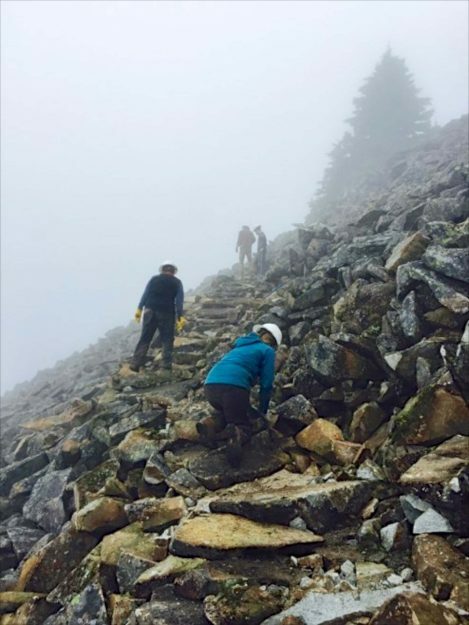 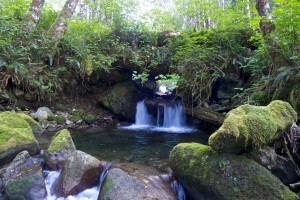 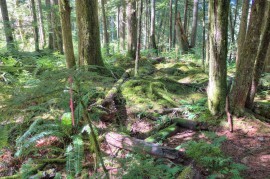 This entry was posted in Middle Fork Trail and tagged new trail on 2015/08/15 by mvanderbilt. 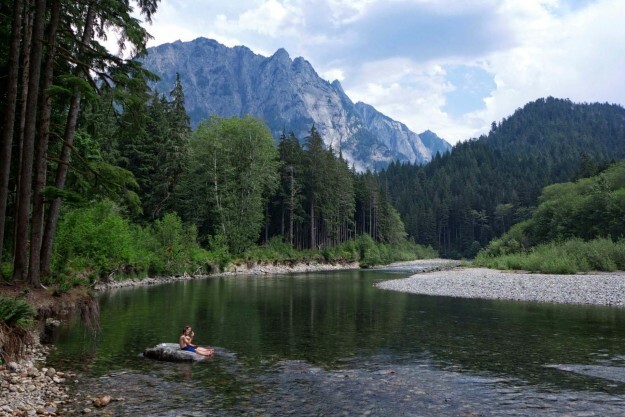 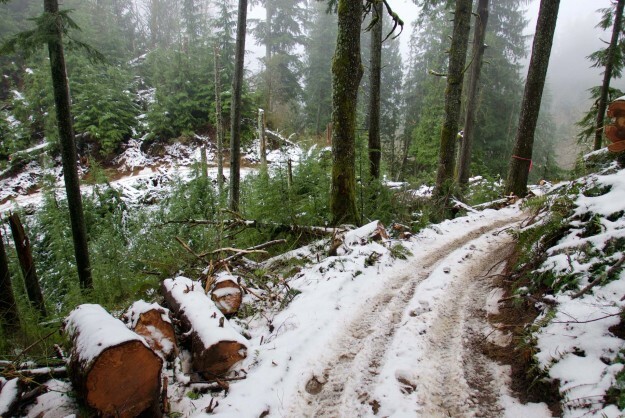 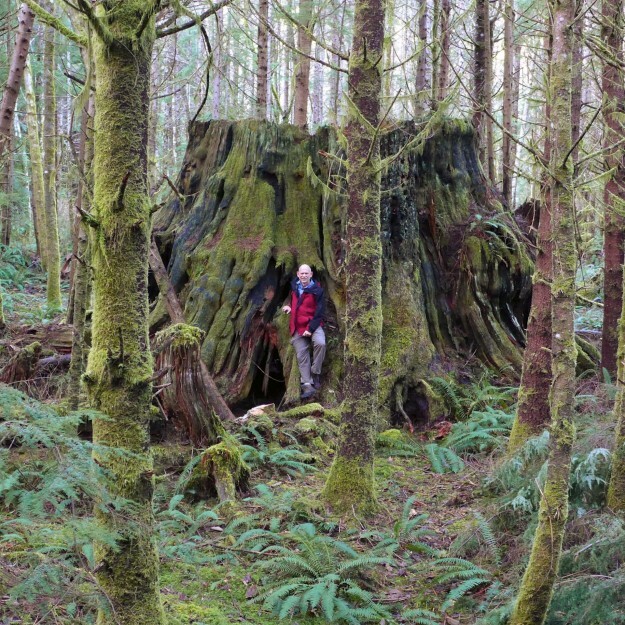 The Forest Service has proposed a minor reroute of the Middle Fork trail #1003 between the Taylor River and Dingford Creek. 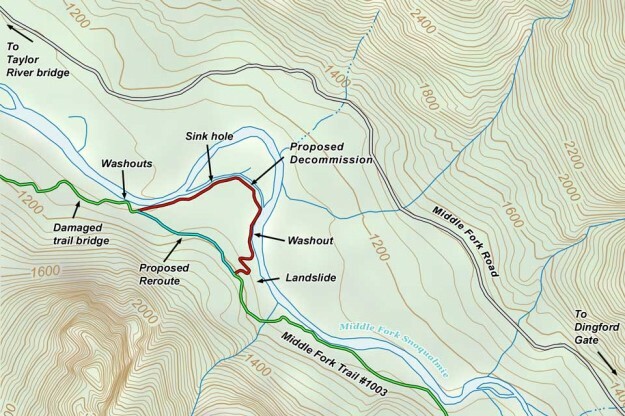 The reroute will avoid an area prone to washouts and landslides caused by normal channel migration of the Middle Fork river. 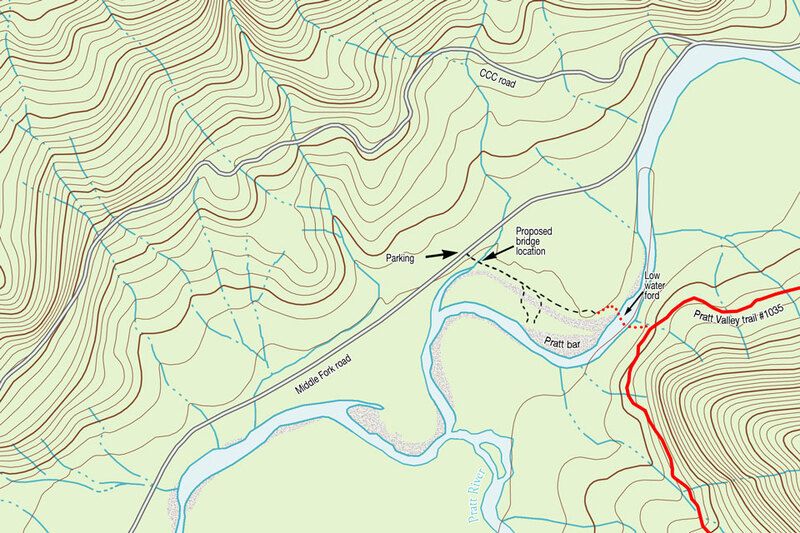 This entry was posted in Middle Fork Trail and tagged new trail, USFS on 2013/08/01 by mvanderbilt. 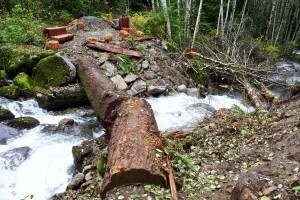 An old deteriorating log stringer bridge crossing Granite Creek was pulled out last year during the DNR road-to-trail conversion of the Granite Lakes trail last fall. 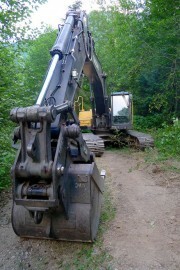 Concrete pads were poured for a pedestrian bridge that will sit far above the creek even at high water, but it will not be installed until this fall, or possibly spring 2014. 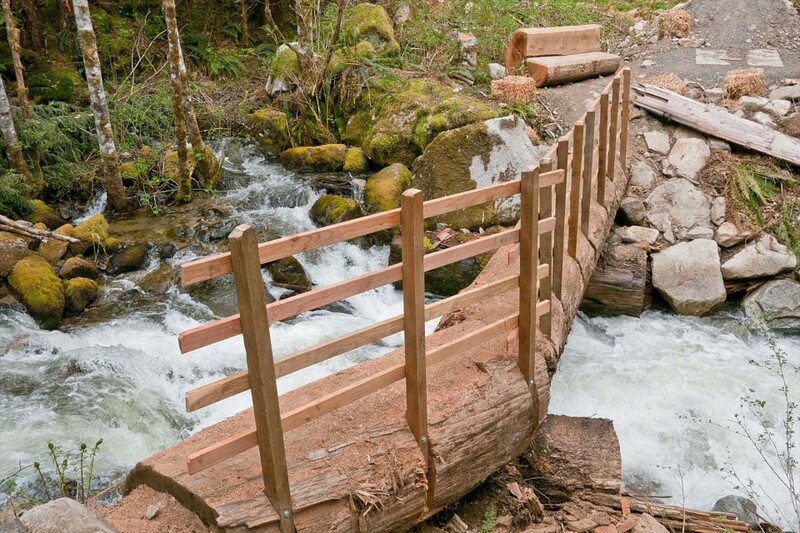 In the meantime, a temporary bridge constructed from pieces of the old log stringers was put into place. 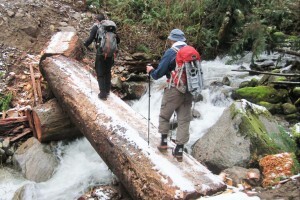 Last winter it was at times a hazardous crossing, especially when icy. 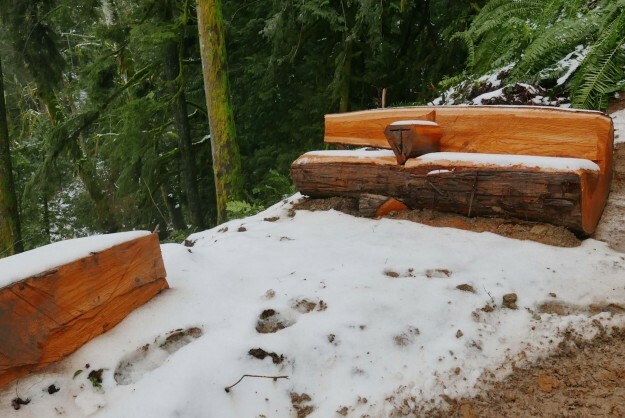 Now railings have been added which should provide for a secure crossing until the new bridge arrives. 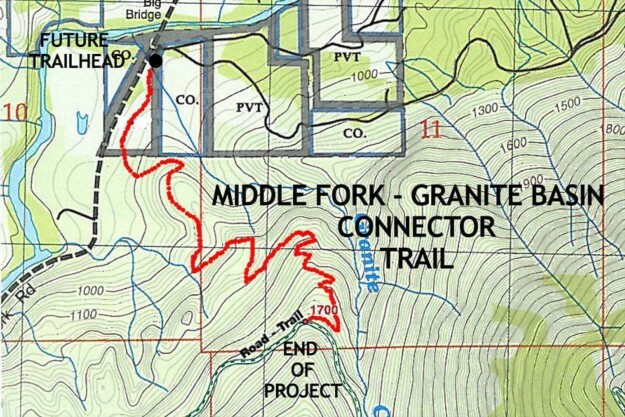 This entry was posted in Granite Creek and tagged DNR, new trail on 2013/05/11 by mvanderbilt.